Definition at line 67 of file Cmt19937.h. Definition at line 75 of file Cmt19937.cpp. Definition at line 84 of file Cmt19937.cpp. Definition at line 241 of file Cmt19937.cpp. References C_INT32, getRandomU(), and CRandom::mFloat. Definition at line 190 of file Cmt19937.cpp. References C_FLOAT64, mLeft, mNext, CRandom::mNumberU, and next_state(). Definition at line 207 of file Cmt19937.cpp. Definition at line 224 of file Cmt19937.cpp. Definition at line 174 of file Cmt19937.cpp. References mLeft, mNext, CRandom::mNumberU, and next_state(). Definition at line 158 of file Cmt19937.cpp. 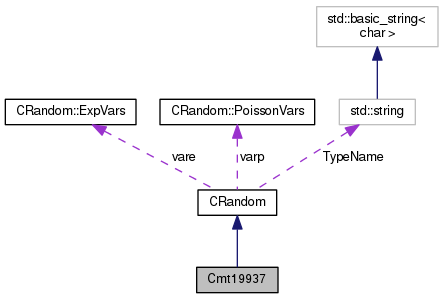 Referenced by genrand_res53(), Cmt19937HR::getRandomCC(), Cmt19937HR::getRandomCO(), and Cmt19937HR::getRandomOO(). Definition at line 106 of file Cmt19937.cpp. References Cmt19937_N, initialize(), mLeft, and mState. Initialize or reinitialize the random number generator with the given seed. Definition at line 87 of file Cmt19937.cpp. References Cmt19937_N, mLeft, and mState. Referenced by Cmt19937(), and init_by_array(). Definition at line 140 of file Cmt19937.cpp. References C_INT32, Cmt19937_M, Cmt19937_N, Cmt19937_TWIST, mLeft, mNext, and mState. Referenced by getRandomCC(), getRandomCO(), getRandomOO(), getRandomS(), and getRandomU(). Definition at line 76 of file Cmt19937.h. Referenced by getRandomCC(), getRandomCO(), getRandomOO(), getRandomS(), getRandomU(), init_by_array(), initialize(), and next_state(). Definition at line 78 of file Cmt19937.h. Referenced by getRandomCC(), getRandomCO(), getRandomOO(), getRandomS(), getRandomU(), and next_state(). Definition at line 74 of file Cmt19937.h. Referenced by init_by_array(), initialize(), and next_state().